Although the U.S. Treasury yield curve represents a snapshot of current interest rates at various maturities, it also reflects expectations about future short-term interest rates. To see this, we must “disaggregate” a long-term Treasury bond into its components. Viewed in this way, the 10-year Treasury note is a composite of one-year Treasury note yields taken successively over the 10-year period. Given current pricing (as of 10/24/08), the market is implicitly anticipating that short-term (i.e. one year or less) Treasury rates will remain below 2% for the next two years, then move above 2% in 2011 and then to around 4% in 2012 and finally to above 5% in 2018.. 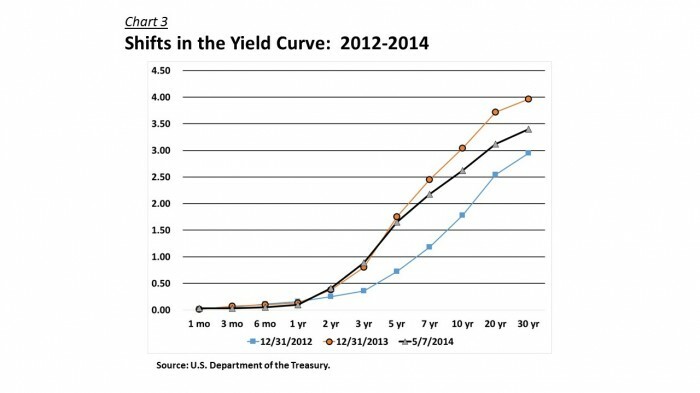 Many market strategists see the short end of the yield curve as an indicator of Federal Reserve policy. The 2-year Treasury note, which is currently yielding 1.57%, is usually viewed as the main predictor of Fed policy. Yet, Fed Funds futures assign an 87% probability to another 50 basis point cut to 1% in the target Fed Funds at the upcoming meeting on October 28-29. Thus, this rate is seen by the bond market as temporary, another step taken to ease the financial crisis. Of course, sentiment as measured by the yield curve can change quickly. Chart 3 shows that at year-end 2007, just 10 months ago, the yield curve was much flatter. By July, the short-end of the yield curve downshifted, as a result of expectations of a further slowing in the economy and the Fed’s decisions to cut the target Fed Funds rate. By October, as a result of the financial crisis, short-term yields had fallen to almost zero, as investors sought T-Bills as a safe haven; but long-term rates were essentially unchanged, as investors pondered the impact of a likely big increase in Federal spending from the financial bail-out legislation. Often and even during this tumultuous period, the Treasury market anticipated the Fed’s moves well in advance of its actions. Although the greatest declines in rates have been experienced on the shortest end of the yield curve, the greatest benefit in terms of total returns have been realized this year by investors in intermediate-term and long-term Treasury securities. According to Lipper, the best year-to-date performance on its mutual fund indexes was registered by its Intermediate U.S. Government Index, which posted a 3.04% total return. The Ryan Labs Treasury Index shows a total return in 2-yr. to 30-yr. Treasury securities of 7.3% year-to-date (through 10/24/08). Recently, the financial crisis has been the primary driver of the Fed’s interest rate policies. Once the crisis is past, it is likely that the Fed will begin to retreat from its accommodative stance and raise short-term rates again. However, with the recent declines in commodity prices, especially oil, the Fed should be able to keep rates low for some time without worrying about a quick pick-up in inflation. Longer-term, given the ballooning of the U.S. Federal budget deficit, controlling inflation will likely be a major challenge.